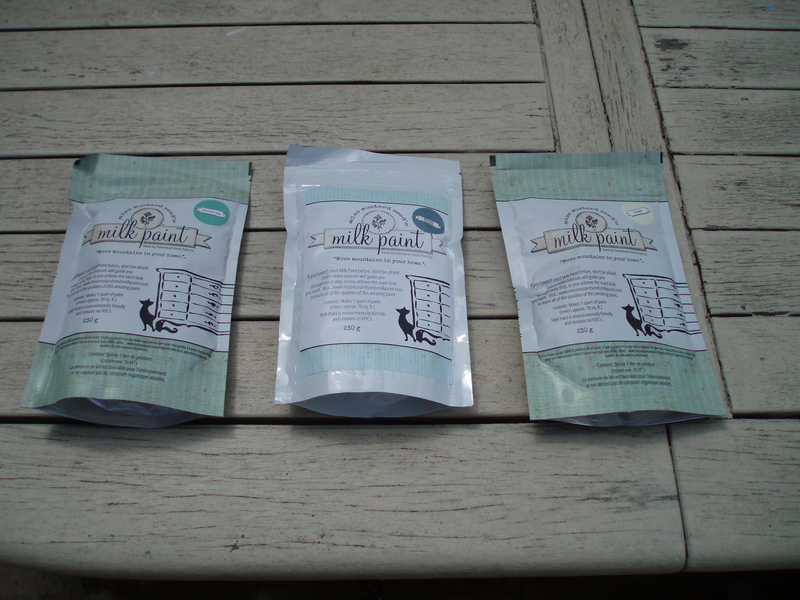 I am rather excited as I received my first order of Miss Mustard Seeds Milk Paint. How wonderful that you can get this delivered to your door and make up as you need it, making the shelf life almost indefinite. A big thank you to http://www.vintagecountrytrading.com Twitter @Vintage_Country. 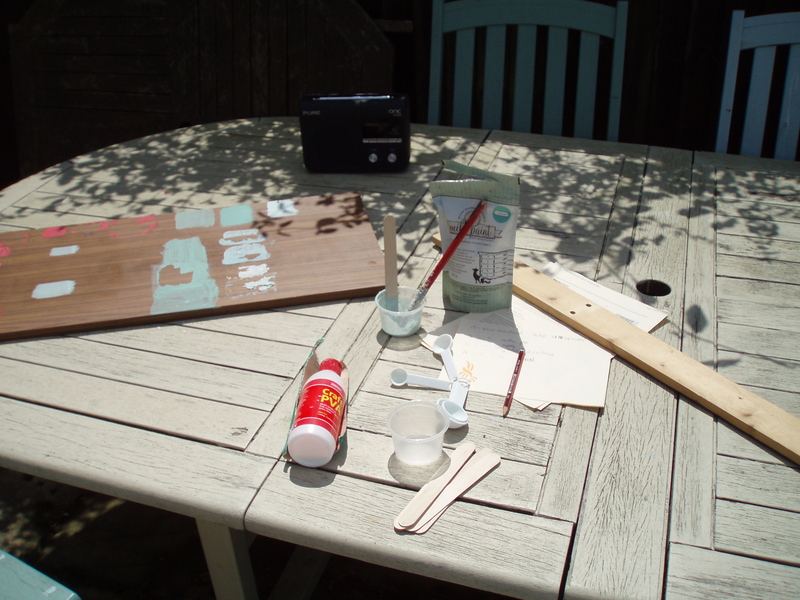 As it was a beautiful sunny day today I set myself up outside to continue experimenting with milk paint, building my confidence to use it on my next piece of restored/upcycled furniture. I have used a clean board with a laminate finish to test the paint on, with a mix of unprepared surface and lightly sanded patches. I mixed up a very small amount of Eulalie’s Sky to start, what a beautiful colour. I applied two coats, allowed time to dry, then rubbed to see how much ‘flaking’ there is and then finally waxed to seal. 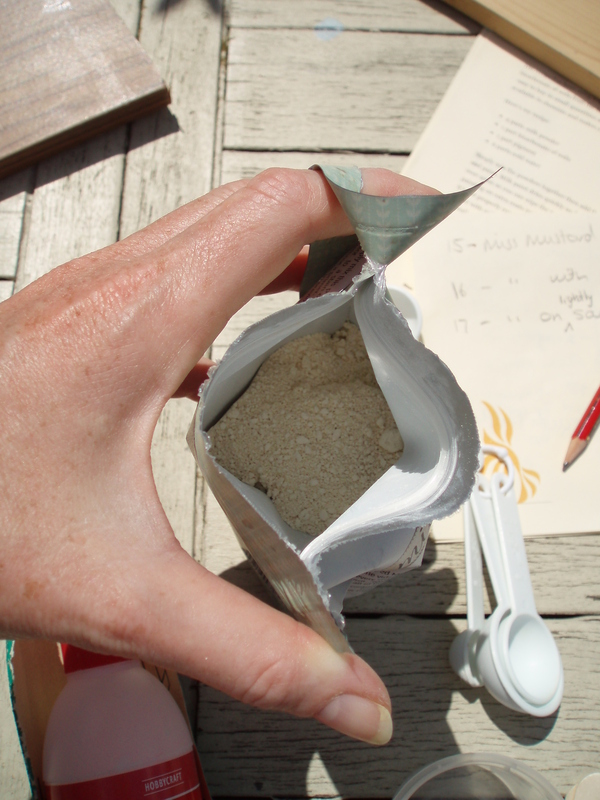 I added a little PVA to number 16 and 18 as a bonding agent. No 15 – Miss Mustard Seeds neat on non sanded surface (1/2 tsp powder to 1 tsp warm water). 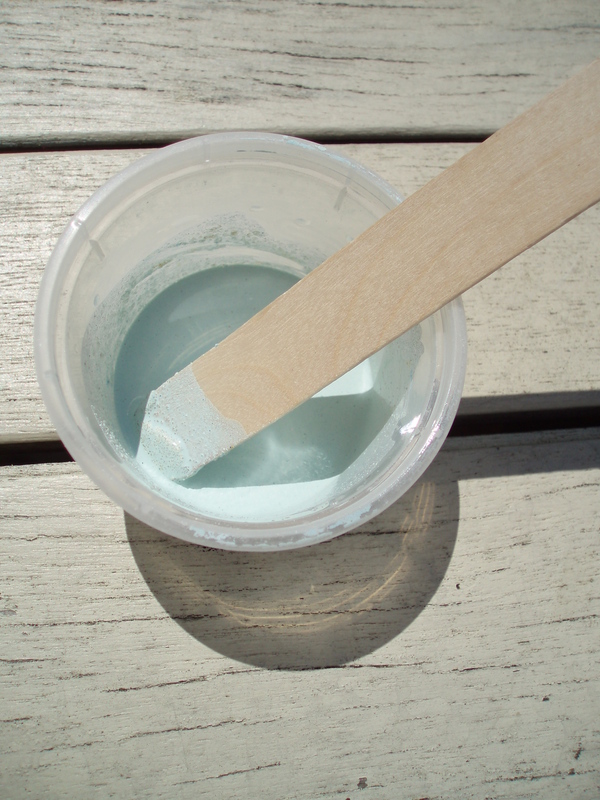 No 16 – As above with a little PVA added as a bonding agent on non sanded surface. 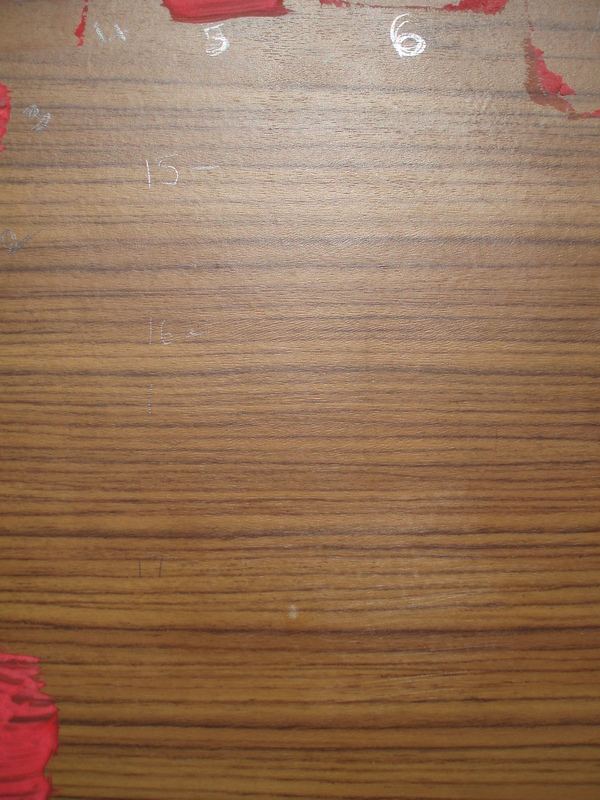 No 18 – As no 16 (with PVA) on a lightly sanded surface. Both No17 & 18 were a good solid finish. No 18 wasn’t any better than 17. So it would seem if you lightly sand you don’t need a bonding agent. 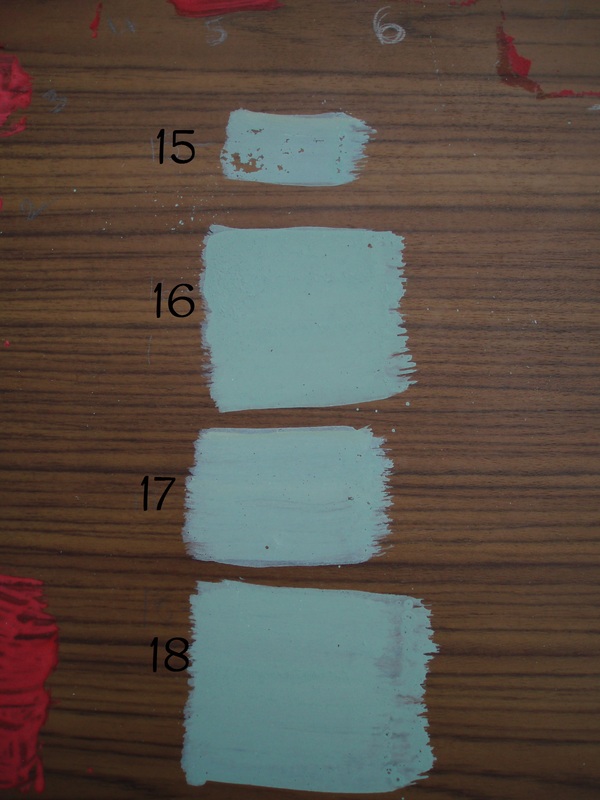 However Annie Sloan and Autentico paint stick directly to this type of surface without any sanding, you do of course still need a clean dry surface. I also tried the paint directly on to a natural wood finish and the paint ‘stuck’ beautifully. Miss Mustard Seeds has lots of useful YouTube tutorials, you can subscribe or follow her on Facebook or Twitter.